In the corner of our new yard was a mysterious stump. It didn't take long for the true identity of the tangle of milky root - within weeks spiky green stalks began poking from the cut trunk. We had a Yucca. With a soon-to-be toddler in the house, a mess of spiky leaves at ground level seemed like a bad idea. "No problem," we thought, "let's just cut it down!" Little did we know that Yucca are like Hercules' Hydra...just when you think you've gotten rid of them, they come back with two heads everywhere you'd cut. Time to up the ante! Most of the advice online we found for removing Yucca involved massive quantities of herbicide, anything from ultra-concentrated Roundup to Draino to pure Diesel. We try to live as organically as possible, and the Yucca is exactly where I want to plant our vegetable garden, so this route just wasn't an option to consider. I'll also be covering the area with a thick layer of newspaper to try to prevent any stragglers from popping up. I will update if the Yucca reappears...as the pessimists (realists? more experienced yuccateers?) on Gardenweb Forums seem to say. Update as of May, 2017: It was a success! 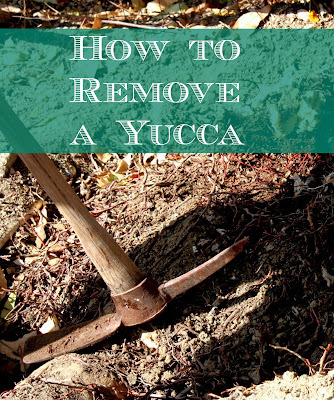 Here are the details on exactly what we did to keep the yuccas out. Thanks for the post...Any update for us? Hi @danainprov Thanks for the reminder! I'm happy to report that we are yucca-free! Its been 3 years and they're all gone now. I'll update the article with details for you!